This character profile has been written for Zaduss, one of our supporters. If you enjoy it, you can check out the other profiles we’ve written, too! The arrow split through metal and leather and came out the back of the head. Zaduss wasn’t even sure if what he shot was a Forsaken or one of the mindless undead — there was no time for him to find out. A new target presented itself and he sighted and fired, keeping the way clear. When the boat finally filled with the soot-stained, weeping or silent or stunned, and the captain gave the order to push off he stood in the back and fired and fired, and each shot struck home — taking what would be a heart or head in a living being. Accuracy was important. He remained calm, astonished and grateful to feel the clarity of the Light throughout every motion he made. Every shot he chose felt guided. He didn’t recognize the voice but saw that it was correct. A group of six of them was piling into a small Horde patrol boat. Loaded as they were, the Draenei vessel would not be able to outrun it. But that was something the Light could help him with. He called to it, chose the largest of the Horde on the vessel and marked him. This one, show him our judgement. He could feel it building, like the sound of the Vindicaar as her engines drew upon that same power and felt the static of it play across his horns. The explosion of Light took them before they’d even managed to shove off from the shore. Zaduss saw at least two dead, and more importantly, their boat scuttled. Less than a minute later, the Ghost of Kaarinos was well on the open water speeding towards Azuremyst. From that vantage Zaduss could see the flames as the massive tree roiled with them. It wouldn’t have seemed possible, but the past few years had been a series of impossible things, and he no longer used the word casually. He kept his eyes scanning for any other Horde vessels, feeling the Light building back up to full within him. The passengers were a filthy, bedraggled lot. 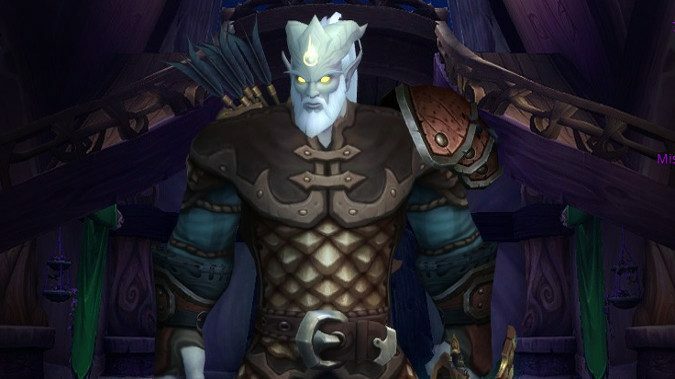 The sight of them filled Zaduss with pain, remembering his own life, so long ago — he’d been a solitary Eredar then, one who enjoyed hunting and the natural world of Argus far more than the glittering crystal spires of their proud civilization. Zaduss had even then felt that civilization was a thing best kept at arm’s length. So it transpired that he’d been hunting alone when he came upon a band fleeing into the mountains, and a moment spent helping them figure out their bearings had become a whole new life. He swept the horizon again, seeing elf men cradling their children, an elf woman with several wounds on her face and arms holding a broken glaive like a makeshift short sword, staring at the stains on the remaining blade. Her armor was broken in several places. He remembered clutching his first bow, long ago left broken on a now-broken world, as he ran out of arrows and used it as a club. You can survive even this he thought, but did not say. It wasn’t his place. Their pain needed to be felt before it could be moved past. It was a truism, but one he’d heard from Velen himself, the only time they’d spoken. Your pain is real, it is important, and you must allow yourself to feel it before you move past it. It had only really become true to him when they’d arrived in the skies above Argus, seen what the Eredar had done to their once beautiful world. Seen the poor brutes who were the descendants of the wildlife he’d hunted and lived alongside, their bodies twisted by countless generations on a fel-twisted hell. Seeing it, he knew at last the pain the Prophet must have felt the day they fled, the cost paid for their escape. The ship arrived at the dock without fanfare, and Zaduss helped as many as he could into the arms of those waiting for them. Draenei in shining armor had drawn up ranks, and all were preparing in case the Horde’s mad warchief tried to pursue her victims to their shore. The sight of the World Tree was like a torch on the horizon, a mountain-sized inferno none could ignore. Even now ashes were falling like snow on Azuremyst, blown from the colossal pyre of a once-living thing. The woman with the broken glaive got off the boat last, her eyes unseeing. She clutched it tightly, the muscles of her arms corded. Clearly a trained fighter, her bearing rigid and each step clearly costing her in pain she wouldn’t admit. He watched her go, wishing he had words for what she was enduring, something he could say to them all. He could see that it rankled the man, but he nodded. Zaduss sighed, laid a hand on his shoulder, and then took his leave. Walking the path to the Exodar, the falling ashes beginning to form sooty drifts on the ground, the smell of aromatic woodsmoke in his nostrils he remembered taking the Lightforged test. Looking deep into himself, expecting to fail, astonished to instead be accepted by the Light. To find its touch blazing from atop his skullplate, see its presence on his skin. In the midst of so much death and loss, the constant reminder that the Light would not abandon them. He stayed on the dock, watched the last few ships come in. Waited, his bow at the ready. If they came, they would find him waiting for them.